I spent a little time yesterday and today poking at an old project to encode video into the WebM format we use at Wikipedia on your iPhone or iPad so you could, potentially, take video and upload it directly. The default encoding settings were mmmuuuucccchhhh tttoooooo ssslllooowww to be practical, so I had to tune it to use a faster configuration. But to maintain quality, you have to bump up the bitrate (and thus file size) significantly. This same tradeoff is made in the hardware video encoders in the device, too! 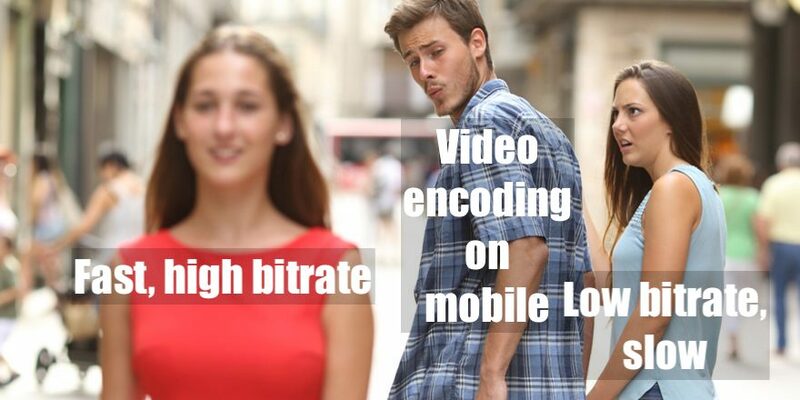 When you’re making a regular camera recording the bitrate is actually several times higher than it would be on a typical download/stream of the same video from YouTube/Netflix/etc. You just don’t have the luxury of the extra encoding time on a modest mobile chip, especially not if you’re recording live.